The problem with sticking to one big project through an event is that the photos are much the same. I've tried a different angle here, showing the fleece. I'm pulling locks from the raw, dirty, greasy fleece and dog-combing both ends of each, for a well-separated, parallel handful of fibres. This is a technique I was shown on my very first spinning lesson, and one I find more therapeutic than using the big combs, with much the same result. The fleece isn't so dirty, my hands and wheel are staying pretty clean, and I'm sure the lanolin is doing my skin some good. I can't wait to see whether the colour lightens when the yarn is finally washed. One interesting thing is the variation in shade from light to dark. I'm now planning to 3-ply the very fine singles, a true 3-ply rather than navajo, so that might blend that variation a bit. 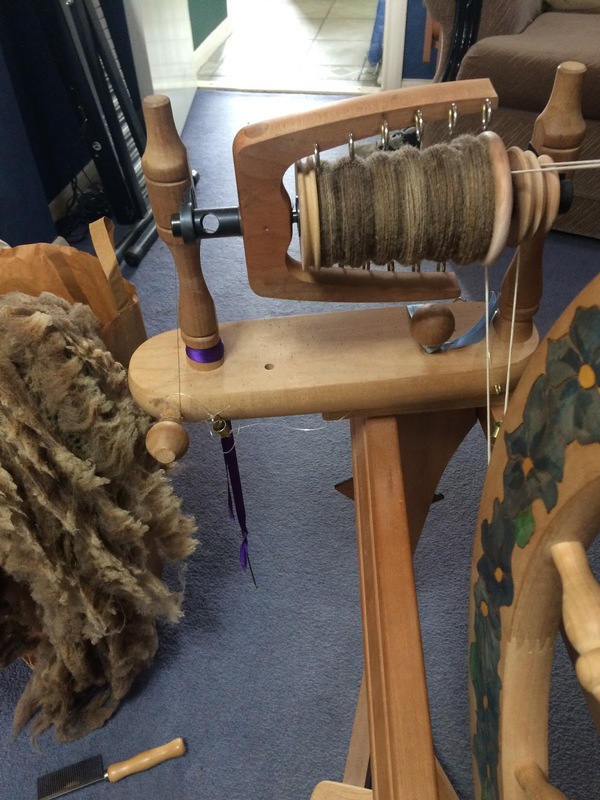 I'm enjoying this so much, it was difficult to take a rest day yesterday (Monday) but today's stage (10) is 'hilly' so I'll start a new bobbin, put in a bit of effort later today and make some more progress.